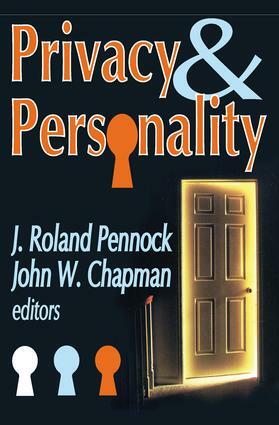 Like many concepts, privacy has a commonly accepted core of meaning with an indefinite or variable periphery. Some would wish to enlarge the core. It would be pointless to attempt to establish a definition by way of introduction to a series of essays that themselves provide no single definition. But the themes of freedom, justice, rational choice, and community always seem to appear in any discussion of privacy. Privacy is a penultimate good. Perhaps, in certain usages--such as autonomy--it is an ultimate good, desirable for its own sake and grounded on nothing more final. Of course, the right of privacy may sometimes be asserted to conceal illegal or immoral acts. When that occurs, it appears to be put to an instrumental use. But, insofar as we justify such claims, it is not because they prevent the detection of immorality or violations of the law. Rather, at least in the case of illegal acts, it is because the means being challenged themselves violate privacy.The individual control-human dignity foundation for privacy, is closely related to personality. Privacy provides relief from tension and opportunity for the development of intimate relations with others. All of us have standards of behavior that are higher than we can maintain at all times, and these standards are widely shared in the society in which we live. If we do not observe them we are likely to be criticized, or we fear that we shall be, and we suffer also from loss of self-esteem. Whether in some final sense the concept of privacy is culture bound is impossible to establish, in the absence of any known society in which elements of privacy are not to be found.